The Sega video game, "Oshare Majou Mahou Card" (Magic Card of the Best Dressed Witch), allows Japanese girls to turn themselves into well dressed dancing caucasians in the virtual. Oshare means "dressed up" or "well dressed" but as well see, this is a competitive game so I have rendered it as "Best Dressed"
The official site is in Japanese. The game seems to be a combination of a virtual version of the video dance game "Dance Dance Revolution," and virtual fashion using swipe cards, in a competitive format. 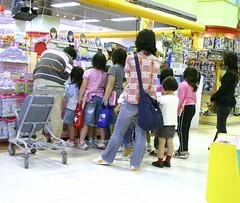 Players purchase clothes which their virtual personas wear before taking on the computer or a friend in a battle of who is the most "oshare," where oshare means well dressed and cooly attractive at dancing. By pressing the keys in time with the music, the young lady with the best fashion sense (I am not sure of the criteria) and best moves, wins the battle of the Best Dressed Witch. Perhaps this information is stored on the swipe card. I am not sure. The two girls are called "Rabu and Beri-" ("Love and Berry") often being appended to "RabuBeri" or "Raberi" ("lovely"). In their cartoon form these characters are pretty Mid Pacific as are many manga characters, with features that do not define them as being part of any race or nation. Recently two caucasian models have been used to represent Love and Berry in some magazine adverts directed at young girls. 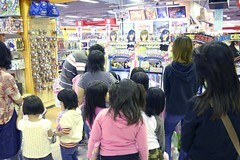 The game is enjoying immense popularity with cues of preteen girls and their parents forming at video arcades all over Japan.